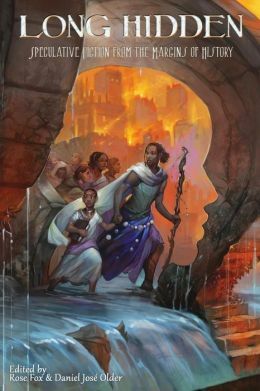 Welcome to the third and final part of my review of Long Hidden: Speculative Fiction from the Margins of History, edited by Rose Fox and Daniel José Older. With over two dozen pieces of fiction, I would have been cheating everyone if I tried to talk about all of my favorite stories in just one post. If you like what you read here, check out part one, and part two. To unpack the subtitle of the anthology just a little bit, what are “the margins of history”? Among other things, it’s the edges, the background, the stories that haven’t been told, the viewpoints that were pushed aside. We’ve all heard the phrase “history is written by the winners”, and those “winners” often only tell their side of the story, their interpretation. The margins are what the writers of the history books left out, most often women and minorities. the writers of the history books may call themselves the winners, but look at what they’ve lost! By pushing people and cultures and religions and stories into the margins, we get such a narrow view of the world. And isn’t this exactly what speculative fiction is supposed to be about? Widening our horizons, seeing everything that’s out there? (Knotting Grass, Holding Ring), by Ken Liu – Easily one of my favorites in the collection, as I am a huge Ken Liu fan. in the mid 1600s, in Yangzhou China, two women are on the way to their client. Half porter, half assistant, Sparrow’s job includes carrying instruments and parcels, and making sure the client pays up. Green Siskin on the other hand, is the beautiful entertainer, carried through the city on a palanquin, as walking with bound feet is very difficult. Green Siskin offers the military men she has been hired to entertain a Tanci story, one of a prince who decided to save his father’s favorite concubine. Sparrow burns with jealousy, but even she’s got to admin that Green Siskin knows a thing or two about how to flatter men, how to get them to do exactly what she wants. The men flatter her back, but they see her as a lowly whore. The Manchus are on the march, and soon the city is under siege. With the subtle elgance of a tanci song, Green Siskin quietly saves all the women she is able. She knows what she’s capable of, she knows how to get men to do what she wants. As always, Liu’s prose is as gorgeous as blossoms falling from a tree on a perfect day. Green Siskin knows exactly what people think when they look at her. She knows the women in the prison courtyard want her to feel ashamed of herself, to be disgusted by what she does. She never complains, never brags, never asks for pity, never even asks to be seen as anything more than a whore with bound feet. She just saves as many people as she can from death and violence.